STRUGGLING TO MAKE MONEY WITH YOUR MUSIC? with The Music Marketing Guidebook. 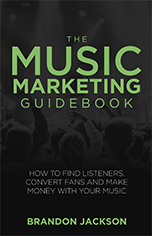 The Music Marketing Guidebook is a brand new book, audiobook and online course to teach you exactly how to market and promote your music to new fans and start making money with your music. Download a free mp3 sample by signing up below! You'll also get our FREE music business tips delivered weekly. © Copyright 2019 KDMR Music. All rights reserved.